It wasn’t easy replacing the sign industry’s standard electro-magnetic neon transformers. But today Ventex Technology’s UL 2161 listed Generation III Electronic Neon Power Supplies are widely considered the neon sign industry standard. That evolution took place as a result of a series of technological power supply breakthroughs developed by the Ventex engineering team. As you would expect, the Ventex team continues to push the envelope in indoor and outdoor sign lighting technology. UL2161 is the standard created by UL to address the change in the 1996 National Electric Code, which requires any electronic power supplies with a secondary output greater than 2000v to have secondary ground fault protection. 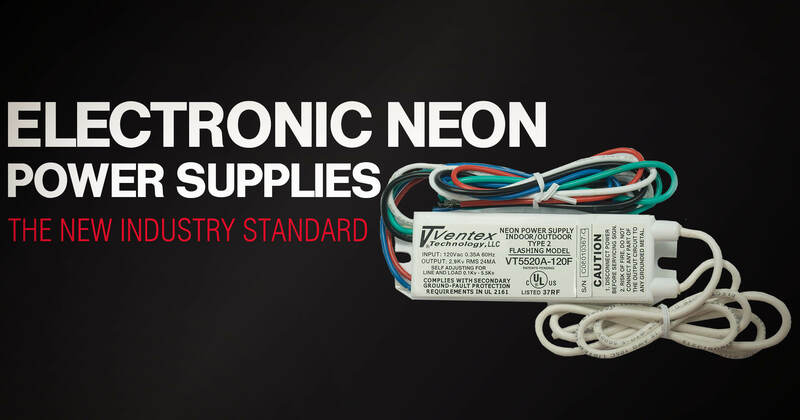 Ventex Technology led the industry in addressing this new standard, providing the sign lighting industry with the most reliable neon power supplies on the market for the last two decades! Generation III technology does more to keep your sign illuminated and protect your corporate branding investment than any other electronic neon power supply or electro-magnetic transformer.